Leaving a legacy at the University of Toledo is something many alumni and fans want to support, but often times, do not know how to initiate. Without some action on your part, your annual support will conclude at the end of your life. However, your support of the Rockets does not have to end. The Rocket Fund Legacy Society provides all Rocket supporters the opportunity to ensure their giving continues in perpetuity. The Rocket Fund is the official annual giving program of the University of Toledo Athletic department, and is vital to the success of our student-athletes and coaches. This support helps to fund scholarships, academic assistance, team travel and equipment needs, and many other priorities for the nearly 400 student-athletes participating in 16 Division I varsity sports at the University of Toledo. As we build on our success and plan for the future, it is imperative that we establish a Rocket Fund endowment that supports our student-athletes in perpetuity. Here is how the program works: The Athletic Department can use 4% of the Rocket Fund endowment annually to address the Department’s top priorities. Any investment gains in the endowment above the 4% are added to the principle amount each year to ensure the endowment remains in perpetuity. For example, if your current annual Rocket Fund gift is $1,000, multiply it by 25, and $25,000 is the amount needed in the Rocket Fund endowment to generate your current annual gift forever. If you have any questions, please do not hesitate to reach out to us here in the development office. For more information on becoming a member of the Rocket Fund Legacy Society call 419-530-4183. *All donors who join the society will be recognized on our Rocket Fund Legacy Society Wall in John F. Savage Arena and on our website. Gifts and Pledges: You can join the Rocket Fund Legacy Society by making a one-time gift or by making a pledge payable over 2-5 years. Bequests: Giving through your will or revocable living trust is among the most popular ways to make an estate gift. Please contact us for the language that you would need to include in your estate planning document. Life Insurance: If you have a life insurance policy that you no longer need, consider gifting the policy to the UT Foundation for the Rocket Fund endowment, or make UT the policy’s beneficiary. Charitable Gift Annuities: You can make a gift to the University of Toledo, and receive an income for the rest of your life through a charitable gift annuity (CGA). Retirement Plan Assets: You can designate the UT Foundation as a beneficiary of your retirement plan or IRA, and donors at age 70 ½ and older can take advantage of the IRA charitable rollover. You can make charitable contributions directly from your IRA without having to pay tax on the distribution. Those who become members of the Rocket Fund Legacy Society through a planned gift are also members of the University of Toledo’s Heritage Oak Society. Members of the Heritage Oak Society have expressed their commitment to the University of Toledo through a legacy gift. Benefits of members may include luncheons, invitations to special events, and a subscription to our newsletter. In addition to being a Rocket Forever, the most important benefit you will receive as a member is the satisfaction of knowing you will make a major difference in the lives of our student-athletes. A longtime supporter of Rocket Athletics and active member of the Downtown Coaches Association, Joe Fink is participating in the Rocket Fund Legacy Society. 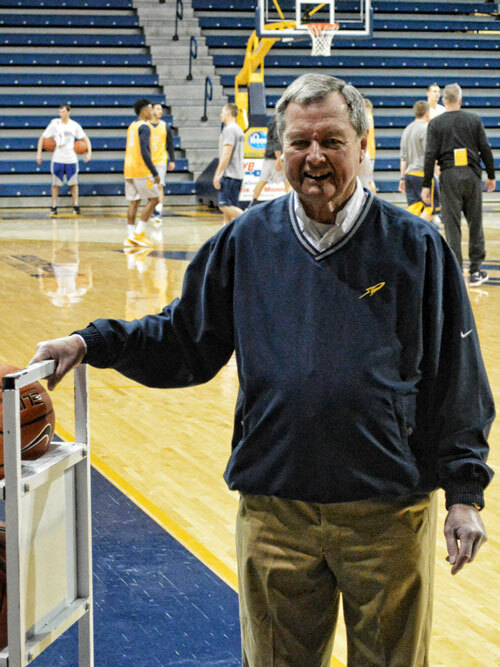 By purchasing a $100,000 life insurance policy that names The University of Toledo Foundation as the owner and beneficiary, Joe will continue to provide an annual gift to the program in perpetuity. Below is a brief Q & A that explains why Joe chose to be a Rocket Forever. Why are you participating in the Rocket Fund Legacy Society? Joe: It’s been something I’ve wanted to do for a long time. The premiums on the policy are affordable and it allows me to do something a little bigger. I give annually to the Rocket Fund right now, and this will be a legacy gift that will take the place of my annual gifts after I pass away. Why do you support Rocket Athletics? Joe: I’ve been involved in sports since I was a kid. After I graduated from UT, I just felt supporting the Athletic Department was something I should do. I’ve also had season tickets for Rocket football and basketball since 1976. Do you have a special memory in your many years as a Rocket fan? Joe: There have been a lot of great memories, but the overtime win at the Las Vegas Bowl in 1995 might be the best. I’ll never forget Wasean Tait’s touchdown to win it in overtime. We had a lot of fans from Toledo at the game. It was just a very exciting win.